Indigenous students remain one of the least represented populations in higher education. They continue to account for only one percent of the total post-secondary student population, and this lack of representation is felt in multiple ways beyond enrollment. Less research money is spent studying Indigenous students, and their interests are often left out of projects that otherwise purport to address diversity in higher education. Recently, Native scholars have started to reclaim research through the development of their own research methodologies and paradigms that are based in tribal knowledge systems and values, and that allow inherent Indigenous knowledge and lived experiences to strengthen the research. Reclaiming Indigenous Research in Higher Education highlights the current scholarship emerging from these scholars of higher education. From understanding how Native American students make their way through school, to tracking tribal college and university transfer students, this book allows Native scholars to take center stage, and shines the light squarely on those least represented among us. "A critically important contribution to Indigenous research methodology literature and guide to stronger, wiser research in academe and society. These authors facilitate decolonization of existing paradigms of research and continued creation and reclaiming of Indigenous epistemologies and practices of scholarship." 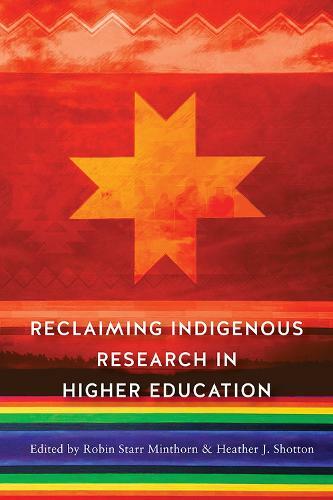 --Alicia Fedelina Ch vez "coauthor of Teaching Across Cultural Strengths "
"Reclaiming Indigenous Research in Higher Education asserts the rightful place of Indigenous knowledge and ways of doing in the academy. The wisdom and 'heart work' exhibited by these authors honors the teachings of our elders and underscores the importance of authenticity and realness in our scholarly work." --Susan C. Faircloth "professor, University of North Carolina Wilmington "